In this blog post, you will learn the basics of DBT. Following this post, there are two more posts that explain in a very brief way the 4 modules of DBT. 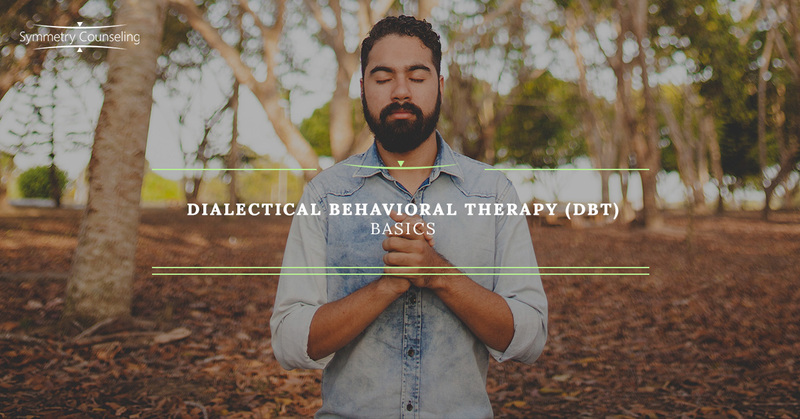 Dialectical Behavioral Therapy, also known as DBT, was created by Marsha Linehan, who is currently still teaching at the University of Washington-Seattle. When DBT was first identified in the 1990s, it was originally known to help individuals with Borderline Personality Disorder (BPD), but now DBT is useful for all individuals with that suffer from depression, anxiety, eating disorders, substance abuse, and relationship issues. DBT is a similar concept to CBT (Cognitive Behavioral Therapy) but also includes mindfulness skills. DBT addresses “splitting,” which is very common in BPD, and the goal is to help solve black and white thinking (inability to bring together positive and negative thoughts) by creating a combination between extremes and opposites. Identifying acceptance versus change is necessary to mastering DBT. DBT and CBT differ in a few other areas. DBT is a skills-based therapeutic approach, while CBT is more process-based. CBT tells us what to change, while DBT, through mindfulness, tells us how to change the beliefs. DBT is also able to be used in group therapy or individual therapy. Traditional DBT is a long-term therapeutic relationship and intense treatment can allow the individual to meet with a therapist two times a week for group therapy or individual therapy. Dialectics is a big part of DBT in which acceptance versus change is necessary. Dialectics means that two opposing ideas can be true at one given time. Essentially, it allows individuals to solve a problem in various ways, instead of just looking at it with one perspective. Alcoholics Anonymous’ Serenity Prayer is a good foundation for DBT. The Serenity Prayer teaches individuals that we need wisdom to change and wisdom to accept. Individuals need all three to work together in order to work. Change <—>Wisdom <—>Acceptance. Also understanding that reality is different for all people and everything to connected to everything else. Change is constant and inevitable, which can be difficult for individuals expecting change right away. The Behavioral Chain Analysis is a major part of DBT. In DBT, it is said that any behavior can be understood as a series of linked components which all work together. The chain analysis allows clients to develop the ability to analyze and understand ineffective problematic behaviors. When an individual has a problem, the first instinct is to solve it. According to DBT, there are various ways to actually manage a problem. Solve the Problem is the most common approach to dealing with a situation. An individual can either change or leave the situation. An individual can either figure out a way to change the situation, avoid the situation, or chose to leave the situation. Change Your Perspective is another approach that an individual is able to regulate the emotions that come with the problem. Each individual has a choice to change the situation or not, but an individual must change the emotions in reaction to the problem. Tolerate the Problem is another approach in DBT to help with solving a problem. In this approach, an individual might not be able to solve the problem or feel better about the problem but easing some of the emotional suffering that the problem brings. Being able to accept the problem can cause relief. The last approach discussed in DBT is Staying Miserable. In this, the individual has a choice to stay where they are and not make any changes and not look at their emotions to see what is most helpful. Stay tuned for future blog posts that help explain DBT and the 4 modules. For questions/comments, feel free to contact Meenal Patel, LPC at MPatel@symmetrycounseling.com.